Yes, we can say that. We went to Cologne with modest goals, and we fulfilled all of them! 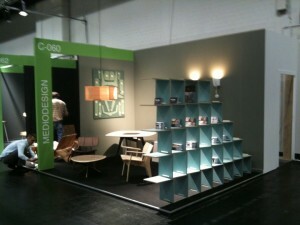 first of all we brought Mediodesign to Cologne to see what the trade and the general public had to say about the collection. We were very curious about their opinions, their comments, their suggestions. Well, we got very positive feedback, interest from all sides, nice compliments and good suggestions. We also went to Cologne to multiply our contacts in the european market. That was such a success! We have interesting leads and confirmed contacts in Germany, Denmark, Zwitserland, The Netherlands, France, Sweden, Spain, Italy, China, Korea, Japan, the U.S. and Puerto Rico. In all gradations, from big retailer to small boutiques, from schools to architectural practices, we now have a good base network to develop our business. 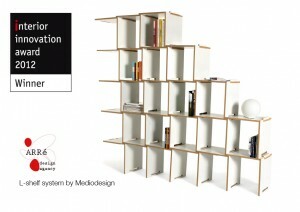 In the same line, the press was very enthousiast about Mediodesign. 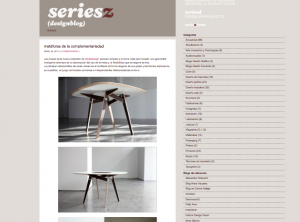 We have a couple of articles in Schöner Wohnen online, before and during the fair, that was great. At the moment, several print and digital media editor have our info, our photos and our stories. 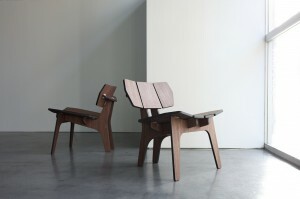 Who knows, maybe there would come more press coverage for Mediodesign. The third goal, which we set up as last one not to bother us during the fair, was to be open and prepared for business. Well, that one was also quite good. We had from day one a lot of interest from retailers and traders in our products. This is wonderful! Juan Pablo Quintero, head of design at Mediodesign, was complimented many times by fellow designers, producers, retailers, architects, etc. Hard work pays, we know that and we know how hard has Juan Pablo worked. Together with his partner María Teresa León and his team in Barcelona, they put years of experience and months of preparation to make the show succesful. We also got a few compliments from some senior trade personalities. They said the business is right, the approach is correct and the products are wonderful. Well, we are doing the best we can!! So, we are still on tracks, better and stronger that before. 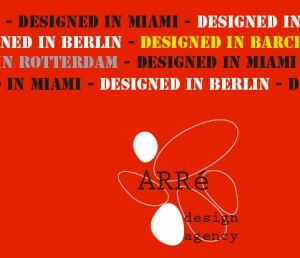 Arré Design Agency and Mediodesign are looking good. We still have a lot to do, but there is confidence in our products in our capacity. This post-fair days and weeks are crucial and we are working hard to respond to our clients. During the official opening day on tuesday january 18th, we got many visitors and many good contacts. We also had visits from the press, the local newspaper here in Cologne, and these guys from Zero Design magazine from Japan. They stayed for almost half an hour at the stand, interviewing Juan Pablo Quintero. 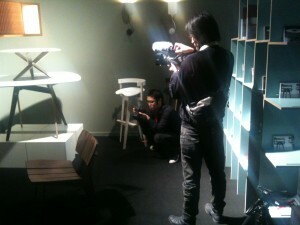 When they were finished talking, they got they gear and started shooting videos and making pictures of the stand and mediodesign’s pieces. Great! See you in Japan! 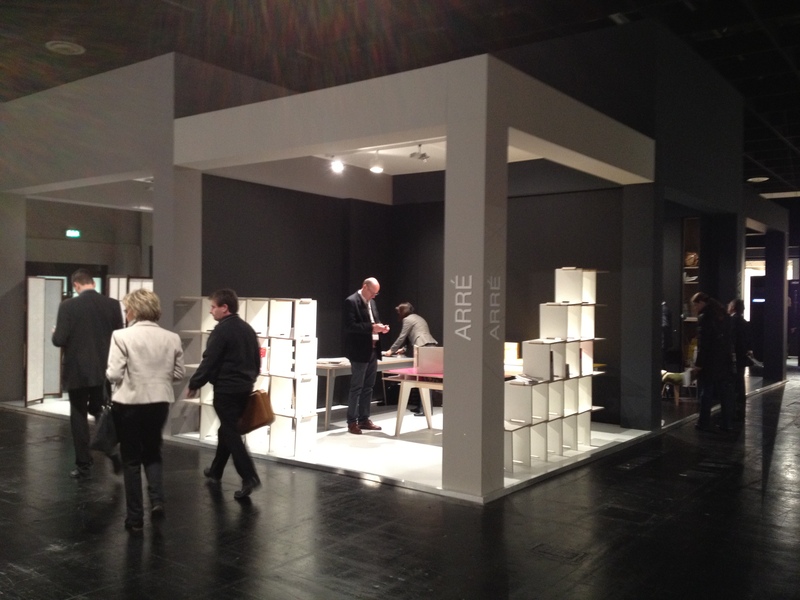 Monday january 17th the IMM Cologne trade fair started for VIP guests and press guess. The pre-opening! With about 300.000 sqare meters of exhibition surface, one of the biggest trade fairs in the sector. We are in! Of course you already know that, but still, we can’t believe it sometimes. During the first day, Maria León, Juan Pablo Quintero, John Larking, Yoraco González and Antonio Paiva were standing at the fair. We made a lot of contacts, about 20 business opportunities and about 6 press contacts. Great for a day with limited entrance. We have incredible attention for the L shelf, and a lot of people stop at our booth to look closely at the system. That gives us the excuse to engage people in conversation and introduce the whole collection, make the contact and get the information we need. It goes fantastic! So we are really excited about the next days, with the offcial opening on tuesday. 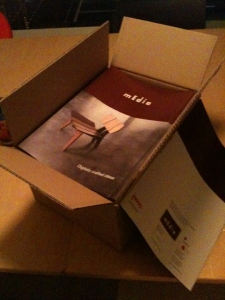 Mediodesign, go!